Whether travelling for business or pleasure, today’s hotel guests expect easy-to-use options for their electronic devices. The Bittel MediaJack is a unique solution for offering hotel room connectivity, combining style with the latest technology. Bittel’s MediaJack allows your guests to fill a room with their own music, videos, pictures, games and more – ultimately increasing their enjoyment and their intent to stay with you again. Hotels worldwide are installing the MediaHub, making it possible for their guests to seamlessly connect their personal media devices to their hotel room television. By the interactive communication with a hotel TV through serial ports, MediaJack automatically identifies signal input without any intervention and auto-switches TV channels, therefore achieves the real plug and play. Simple operation fully embodies the hotel's humanization. MediaJack is compatible with the most popular hotel TV models, such as Philips, Samsung, Sharp , LG, etc. Two AC power interfaces enable guests to easily access to power supply. The power 5V USB port can be used for charging mobile phones, digital camera, iPod and other equipments. The USB data-transmission port is optional at extra cost. Introducing Media Jack Mini, the smallest and most powerful mobile device to TV connectivity panel on the market today. The focus is on simplicity, providing guests with the most important, and universally accepted mobile connections to charge and play (USB, Bluetooth, and HDMI). MediaJack Mini offers USB fast-charging for any phone or tablet, Bluetooth and HDMI. The MediaJack Mini gives your guests the ability to use the in-room TV for any of the content they typically access on their mobile devices. Unleash your in-room entertainment options by making it easy for guests to connect mobile devices and mobile apps to the big screen. With Bluetooth pairing your guests can listen to their music over the TV speakers without docking the phone, providing the freedom to roam and multi-task. MediaFi H is a new generation of guestroom multi-media entertainment control center, which integrates guestroom telephone, clock, digital tuning FM radio, Hi-Fi Stereo speaker and connectivity panel in one. This product not only maintains the cordless telephone features but also enables guests to make full use of their portable devices on hotel TV. Guests can make or answer a call when they are enjoying the contents of electronic devices on HDTV. 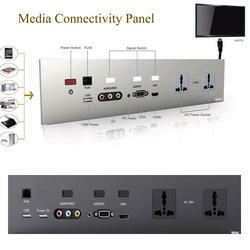 Media Jack-3A is an auto-sensing and auto switching multimedia connectivity panel. 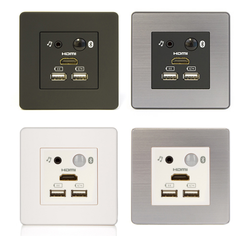 It allows guests to play their own movies, music and games on the hotel TV by connecting their portable devices through Audio/Video ports on Media Jack. More importantly, single HDMI cable installation choice is much easier, faster and more cost-effective. We are a renowned firm involved in presenting a premium quality range of Bittel Media Jack Connectivity Panel which is designed utilizing superb quality basic materials and advance technology by our vendors' trained professionals. In order to deliver perfect range to the customers, the whole range is stringently checked on varied parameters under the direction of our quality experts. Our valued clients can avail these products from us at affordable prices. MediaJack 4A features flush acrylic cover, auto-sensing-and-switching of the last input source, single HDMI cable connection with TV, plug and play function and compatible with all major hotel IPTV systems. Brushed metallic finish and aluminum finish are also available for Mediajack 4A. Powerful in function and esthetic beauty in design, MediaJack 4A is the right choice for you. 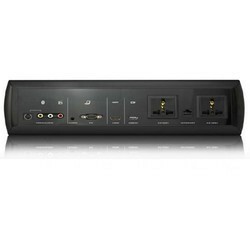 Plug&Play--- TV will automatically switch to HDMI channel after plugging in the video signal. Auto-Power on--- MediaJack will be powered on and play the signal after detecting the input signal; Press "Bluetooth" will also awake MediaJack. Looking for Bittel MediaJack Connectivity Panel ?